The wife and I went out to a comedy show tonight starring Tracy DeGraaf and Michael Issac at our local restaurant Little Joes. The comedy routine was hilarious and even better than I expected. If you get a chance to see this show, definitely go. It's a great night out with some great clean humor. 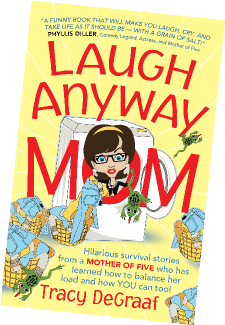 Tracy also has a new book out called Laugh Anyway Mom, which is made up of stories about being a mother of five boys. YIKES!